Our latest offer is from Fujitsu. Once again they are offering a bonus 2 years factory warranty and 5 years interest free on all DUCTED AIR CONDITIONERS purchased from 2/10/18 and paid for until 30/11/18. You will then have until 29/2/19 to claim the extended warranty. For further enquiries please call our office or you can follow the link to the Fujitsu site. 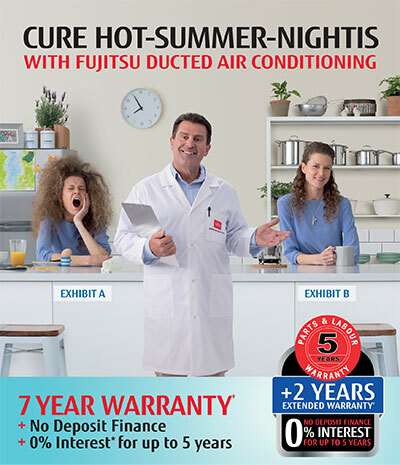 Please note this is an offer from Fujitsu general – Atmosphere Air Conditioning will endeavour to make the registration process as easy as possible but will not be responsible for failure to claim the extended warranty.